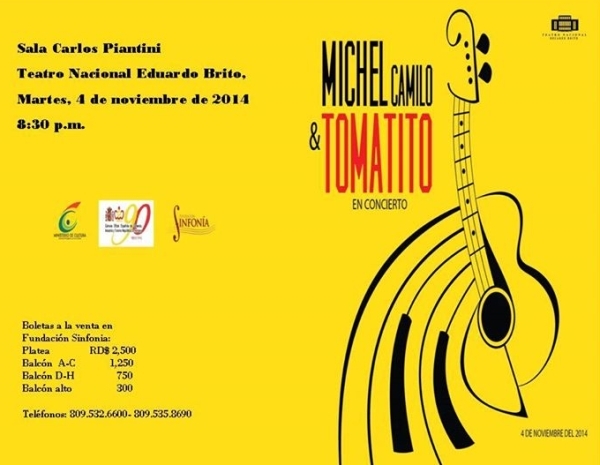 Michael Camilo & Tomatito In Concert November 4, 2014. Dominican jazz pianist Michel Camilo and Spanish gypsy flamenco guitarist Tomatito will be together in Dominican Republic for a much anticipated concert. They have been traveling the world bringing their unique styles to all parts of the world including Korea, Switzerland, Azerbaijan, and USA. We are lucky to have them visit our little island as well. Together they have recorded two very successful award-winning albums: Spain in 2000 and Spain Again in 2006 (purchase “Spain” on iTunes). They have won a Grammy for “Best Latin Jazz Album”, a Latin Grammy for “Best Latin Jazz Album”. The duo will be performing on Tuesday November 4, 2014 at 8:30PM at the Sala Carlos Piantini, Teatro Nacional Eduardo Brito , Plaza de la Cultura, Gazcue. Check out Michael Camino music on iTunes and Tomatito music on iTunes. Events concert, flamenco, jazz, Michael Camilo, teatro nacional, Tomatito. permalink.